PlayOJO is a casino that gives control back to the player, with no wagering requirements, money back on every bet, generous offers and all the games a casino lover could ask for. Our "new world of play" is centred on a character 'OJO', who is a player sidekick that gives the very best casino experience. 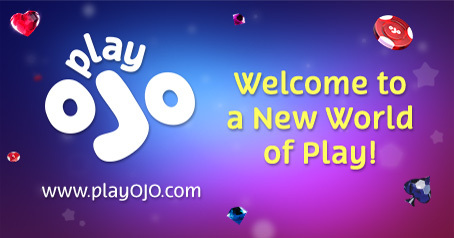 PlayOJO may be the new kid on the block, but we'll soon be recognised as a reputable, generous and unique casino that's rewarding to play at. OJOplus is an exclusive feature that gives players money back on every bet. From the first bet, OJO will put free money into players OJOplus accounts (separate from their real money accounts). OJO pays out on every single wager, win or lose with no limits, no other Casino does this! All Free spin offers are wager Free and players can use their winnings to continue playing or cash them out. No difficult Bonus rules and hard to complete wagering demands. The OJO Wheel is another fun extra that rewards loyalty and gives you more play. Play Moments is a feed that celebrates personal milestones and successes. When a special level is unlocked, players will get a spin on the OJO Wheel. The higher the risk, the bigger the reward. This unique addition displays player milestones, from when players first sign up, their biggest win, OJOplus cashouts and more! There's no shortage of choice when it comes to promotions. When you make the first deposit you get 1 Free Spin for every £1 you deposit (up to 50) which can be played on the likes of Rainbow Riches and Starburst. PlayOJO refers to perks as 'Kickers', with a new Kicker each day. OJO has seasonal promos, slot tournaments, Free Spins, Free Cash, A-lister rewards and OJO Wheel spins. OJO Levels is like a one-way loyalty system, you play, you climb levels and you reap the rewards. Every bet contributes towards moving up levels, the higher the level, the more rewards and you can never drop down levels. You'll also pick up a spin on The OJO Wheel when a special level is unlocked. If you progress through enough levels, you'll receive an invite to join the exclusive Club OJO for the VIP treatment. We use the best gaming technology to deliver an efficient and reliable gaming platform. The user-friendly site is powered by our own SkillOnNet software which delivers a speedy and smooth performance. Our casino boasts stunning visuals with fluid gameplay and you can take play on-the-go with PlayOJO's App. PlayOJO has a stack of tip-top games from progressive jackpots to the latest releases from the biggest names in gaming including NetEnt, AMAYA, Barcrest, Microgaming, WMS, NextGen and more. You can also play live roulette and blackjack with live dealers from major studios like Evolution, XPRO and Novoline! All the most popular payment methods are available from credit and debit cards, prepaid cards and a host of eWallets. We use state-of-the-art security software to ensure every transaction is safe and protected. All payments are digitally encrypted using SSL technology for complete peace of mind. Withdrawals are swift (within a few hours + weekends) and we support all the main currencies for further player convenience. OJO's professional and friendly support team are available 24/7. Our support team or 'crew' as OJO says, can be reached via phone, email or live chat. The support team are knowledgeable and deal with queries quickly. There's also a clear and helpful FAQs section. It is free to become an affiliate at playOJO. You will have instant access to all of our affiliate tools and tracking. Simply sign up today and you can start earning commissions instantly.